Show me what I need to know. Show me what I need to learn. I feel pulled to share this morning’s writing… Full of vulnerability and fear, but also hope and surrender. I’m just going to type what I wrote, without edits or grammatical fixes. The purest form of truth about yourself is in the morning. You are inspired, loving, calm, centred, grateful, hopeful, energetic, and peaceful. Somewhere through out the day, parts of you unravel. Like tugging a piece of thread, it pulls away lending to layers of fray. By evening, you feel a hole. I’ve heard the term “God-Sized Hole” and it’s accurate. It’s something I want to feed, fill with external stimuli. I feel it in my throat and in my heart like a lead blanket on my chest; constricting my breathing. There is nothing external that will ever placate it or remove it. It just grows with every attempt. You know who you are at the start of each day. It’s YOU. Remove whatever you can through out your day which affects your equanimity. Remind yourself of your truth. Silence the voice of doubt/I’m not good enough/that deceptive narrative of self-loathing. Bring it back to this present moment. Where all is as it should be. There is no pain in this moment. There is no shame of the past. There is no fear of the future. You are taken care of. You’ve been gifted a new path full of choices, opportunity, a fresh perspective, new people who are all placed at this stage of life to teach you. Circumstances to build your resilience. Reminders of what you value and order of importance within that value system. A faith that guides you and sustains you. The God-Sized hole lives within your mind; but it is not who you are. You are worthy and complete. Complicated yet simplistic within your needs. Abundance is yours and it’s already part of your today. Your purpose is within shifting focus for yourself and others; so they may also understand their greatness and wholeness. The soul needs no reassurance. It’s the centre of all. It’s the light; there is no darkness. It’s always burning, creating, evolving, full of freedom and ever transforming within shades of LOVE. It will guide you back to who you always were and who you are. Read it when you are confused, afraid, sad, full of shame. You are deeply loved and you deeply love others. In all their stages and phases of growth and within your own too. Practice self-compassion; shame is the root of destruction. Your life is ever-expanding and evolving just as it was meant to. You have all you require now. More than. There is nothing to feed. Full of love and purpose; fulfilled and grounded. Your soul is on fire with it. Don’t look to the end of it. Focus on the person in front of you only. Take good care of them. And then the next and the next. And that’s how my life has been lately. If I focus on the line: the things out of my control, the weight of changes and forks in the road, the big tasks ahead to keep up a business/another career/certification/doing best for my kids…all together it’s just one big long line up to the door with eyes pleading to hurry up. But if I focus on each one singularly, with love and attention, I’m able to bring some equanimity to each element. 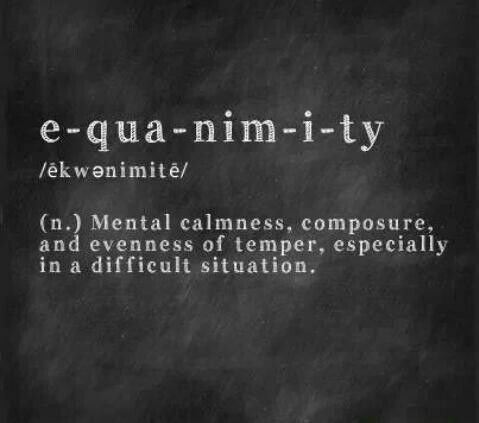 Equanimity: The ability to calm and centre yourself especially under stress. When I first read this word, I knew it was the singular most important trait I needed to learn. Most of my reading has been centred around it; learning tools to bring that balance back no matter what stressors pop up in my day. You can’t control all the stressors in life; but you can change your perceptions, build resilience, and learn to traverse the path of adversity with clarity and a calmness of spirit. Don’t focus on the line friends…just the beautiful face in front of you. The rest will be taken care of in due course. Trust in your abilities. Continue to learn and grow. Situations, people, opportunity and loss are there for a greater purpose. Open your eyes to the lessons right in your back yard. The other day I was talking with a co-worker and we chatted about the next phase in careers. She told me she hoped one day she would be as knowledgeable as a Senior staff member; and worried how she would she ever get there. She felt defeated that she wasn’t growing as fast as she hoped. Now, this girl is 20 years my Junior and we are at the same phase in careers. For me, I can see the next 20 years for her clearly as I have witnessed her work ethic, intelligence, and wisdom beyond her years. Plus I’ve lived the years she’s about to go through. But she’s staring right at one tree. There’s a whole forest beyond. As I was explaining that POV to her, I realized I’m staring at one tree too. Within every stage of life, it’s easy to stare at one tree. 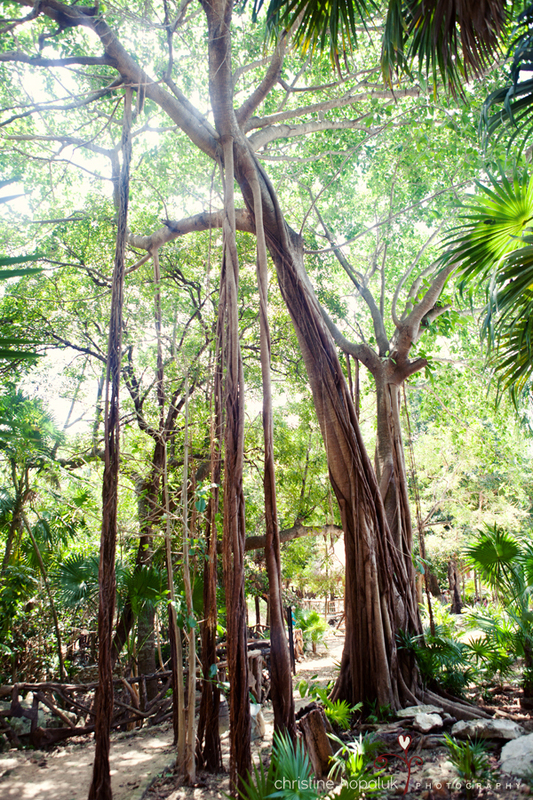 The more narrow your focus, the closer you are to that one tree. The bark is all up in your eyeballs. If you are feeling worried about the details of this stage, remember there is a whole forest beyond it. A whole world of learning, growing, opportunity. Trust in the ever-evolving stages of life and just do your best. You learn the most when you are handed challenges. Expedited growth, which is a gift when you get out into the forest. I had a conversation with a woman who is pregnant with her first child. Newly married, full of hope and excitement for this stage in their lives. I could relate to her as she spoke of her hopes and dreams for her and her baby’s future. The stage where it morphs from a marriage to a family. As conversations go, I reminisced about that time in my life. I could clearly see such parallels within our experiences. I was brought back to that excitement within my reverie. I can’t recall the exact wording she used, and it wasn’t offensive to me, but I realized within our similarities, she saw me differently. Now, there’s no denying I’m a 40 something divorced woman with adultier kids. I share this not to criticize her, but rather because it convicted my own spirit. I realized I often see others as “different from I” which causes a division rather than a connection with others. I have struggled with feeling judged in the past, but how am I feeding my own judgments of others if I can’t recognize how we are the same? Perhaps it comes with wisdom that builds from life experience. Or maybe it comes from the gift of humility through loss. There is something so freeing and comforting when you realize we are all connected within our dreams, goals, hopes, desires, failures, fears and trials. Beautiful connection, we are not alone. We are all navigating life the best way we know with the knowledge and tools we were given. At the root of “same” is feelings. Working Moms or Stay-at-home Moms: we have the same love for our children. We lay awake at night worrying about their futures and vowing to do better the next day. Whether you are a Mom to a newborn; or a Mom to a 40 year old (Love you Mom). Married or Divorced: There is no perfect marriage. Some make it through those waters, and others choose a different path; but I would hazard a guess that all who walk down the aisle do so with hope and a whole lot of love. Those who have children; and those who choose not to have children: We all feel purpose. We will live our purpose how we see fit; the urging of our spirit to pour our heart into something greater than ourselves. We will find fulfillment in life our own way. Faith: There are so many religions; I won’t pretend to know the doctrine of each. I do know that I’m called to love; to give more than I take; to serve others and spread a little compassion..and that’s about all I know. 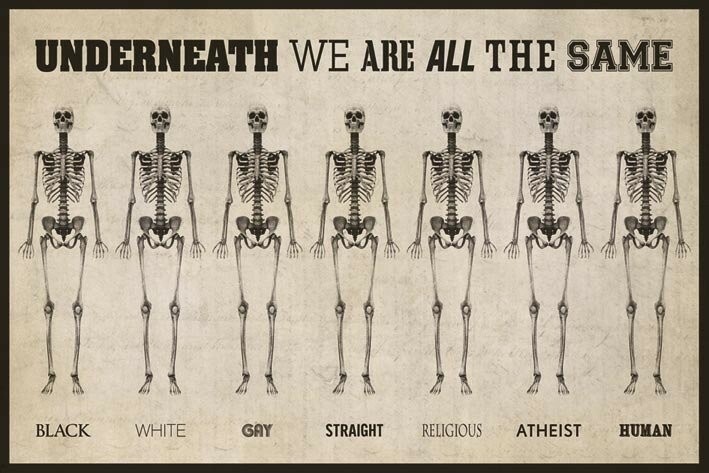 We are the same within love. I think as humans; we seek to understand…and when we can’t understand another’s viewpoint or choices; we just see difference. But *what if, we seek out those elements that unite us. That we can relate to; in even the tiniest of ways. Focus on what we stand for; rather than what we stand against. So today, I will seek out the same. I will look for ways I can learn from others and practice listening to understand. I will celebrate that feeling of unity. I will be grateful for the gift of life lessons which have bred compassion, empathy, and wisdom. At work, there is a Mother and Grandmother who come in regularly. Although we do not speak the same language, or in the case of the Mother…bits of the same, we do share the same warm smiles. Each time they come to my wicket, the Grandmother bows and smiles the largest warmest grin that dances within her kind eyes. She reminds me of the wise Matriarch in Mulan. I’m sure it’s comedic to watch. She bows. I bow. We laugh. She bows. I bow. X10 bowing. on repeat. I can feel her spirit every time. I know nothing about her past or present other than the beautiful aura she carries with her. A brilliant smile, and uplifting presence. Yesterday, the Mother came solo. I asked where Grandma was. She replied that she was resting at home. I could see how much she appreciates having a Mom who loves life the way she does. A gift to her family. Another Zen Joy person who crossed my path. ❤ I am so grateful for these light-sharers who’s mere presence illuminates any room. Who make you feel all warm and fuzzy inside. Who make you believe in the good within the world. That happiness and gratitude is something you choose. And spread it freely. While I struggle some days to choose it; I see that Grandmother as a symbol of what I’m working toward. A countenance of loving life. I used to think happiness was what I most sought after in life; but perhaps it’s fulfillment within life’s various stages. The not seeking the next chapter. Rather, I’m fulfilled now with all that I am and all that I have (none of which are the material variety; but the human interaction kind). My eyes continue to open to what’s important to my spirit. I embrace every lesson which comes my way; and they are often packaged in welcoming smiles and gentle energy. 90 years of wisdom encapsulated in a warm smile and gentle bow. Zero words spoken yet all the words I need (which I’m having a tricky time articulating just how much they mean to me). Her words have danced in my spirit the moment I read them. I have allowed my insecurities and complacency to hold me back from experiencing a richness of life which comes when you take risk, live authentically, and have the courage to be vulnerable with others. It’s what connects us. We all have insecurities in some form or fashion. They manifest differently for everyone. Some mask it with bravado. Some cover it with anger while others feel the weight of shame. As I have worked at being more vulnerable, I have also felt convicted about sharing the areas of strength I’ve felt. As though my pride would be mistaken for vanity. I can spin it back to love however…It’s not vain to love yourself fiercely. To speak passionately about whatever it is that ignites the fires of your spirit. I want that for my children. To be strong, daring, unapologetic for their authenticity, with a vivacious energy that translates into fulfillment and gratitude for this one amazing grace-filled life. Going into the New Year; I will try my best to live more honestly and authentically. To work more on my inner spirit than my outer aesthetic. I believe the outer follows suit to whatever you put into the soul. I am and will be grateful for all that I have and all that I am working towards; quality of life. I have let go of “stuff” and “status”. I have let my mask fall. I have run away pain, and bathed in the murk. I have exercised my voice like a muscle and walked a little taller. I have accepted both my light and dark side. I know my strengths and I know my faults. 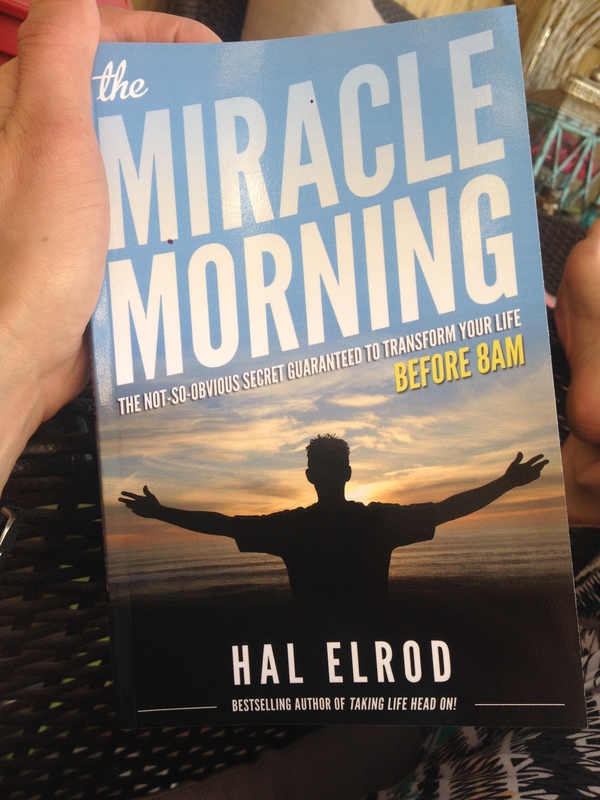 As I worked daily on my spirit; self-awareness flooded my being with every sunrise of my Miracle Morning. When you embrace the uniquely beautiful human you are, and explore the areas or life which excite you. delight you. bring a sparkle to your eye…Your light will shine so bright; it will be impossible not to see. And that light is infectious. WHO makes you feel connected and understood? You see if you are at a place in your life where you are questioning who is in your corner; look to the people who are truly happy for your successes. The ones who feel your happy as much as your pain. But never dim your light for anyone. That’s a betrayal to who you are meant to be. Your life has a purpose; live it passionately and boldly. I will celebrate my successes and will continue to uplift others as they go after their own. Yessss, go get it! United within strength as much as weakness. I hope you have an amazing Christmas full of the love of family and friends. When I finally decided to tackle my health issues, I knew I wanted to do so privately. I didn’t share with my friends or family my plan to get the weight off. Perhaps it was due to fear of failing; but knowing who I am as a person…it was more so because the process for me was full of healing and reclamation of a life I couldn’t live the way I wanted to. I yearned to run down a field with my kids without getting winded, go swimming without shame, and speak up passionately for what I believed in. You see, the excess weight for me was a byproduct of shame and loss after a sexual assault. I won’t blame the assault on turning me into a physically unhealthy person (blood pressure issues/depression/etc. ); however, I do recognize it was the catalyst. It took many years to pack on that weight; and when I decided to shed that extra layer of shame and pain…the weight went along with it. I didn’t know who I was as a woman aside from my roles as a Mom/Wife/Sister/Friend/Daughter. I didn’t follow a plan or strict calorie intake regimen. I made a daily promise to treat me as I treat those I love. To fuel with nutrition and water. Move a little, sometimes a lot, and some days not at all…sweet rest. These past few years I have faced equally confusing and down days as my life has transitioned during a divorce. When I feel that pull to eat away the pain or stay in bed, I try my best to spin it back to love and simply move and eat well. To rebuild my family dynamic with my children in a new way; and just love them deeper. I struggle between lending support to others; yet still honouring my pain and healing process. I prefer to do so privately and quietly. I struggle to articulate to those I love and pull away from that I need to do this for me. It’s not personal to them. I can not support anyone else if I don’t support my process too. I have lost friendships along the way as I have not met other’s needs and expectations. I hope this post shares some insight into the different yet equally healing ways people process various stages in life. There is joy within the pain. There is laughter even through some tears. There is residual anger within the forgiveness. And there is a whole lot of love when you drop the shame and regret. I am so thankful for all that I have; it’s all that I need. I am finding my zen joy a little more every day. Family. Purpose. Fulfillment. Love. Security. Authenticity. Love. Acceptance. I appreciate all who are still there for me when I do some private growing and we just pick up where we left off. I have nothing but love for my friends and family.